When was the last time you spent more than 10 minutes outside for the sole purpose of sitting and enjoying natural sights and sounds? 30 minutes? 1 hour? When was the last time your teen did the same thing? For some people, it might not have been long ago. For others, it could have been ages ago! According to Richard Louv, “nature deficit disorder” (or our lack of time spent outdoors, in green spaces and among wildlife and plants) is to blame for a number of ailments including attention disorders, mood disorders, and lower grades in school. Research has shown that spending time outdoors alleviates symptoms of attention disorders like ADD. (2) to go with them. CTT therapist Megan Yarnall takes clients outdoors 1-2 days per week, conducting only outdoor sessions on particular days. We love to encourage parents to get outside with their teens and practice mindful walking, exercise, and relaxation together. Mindful walking: take a walk around your neighborhood or nearby open space. Take three deep belly breaths to start and then walk in silence for at least 10-15 minutes while you notice what you hear, see, smell, and feel. Touch plants (as long as you are knowledgeable about allergies or anything poisonous), feel the dirt with your hands, listen for birds or water, and so on. Watch the clouds. On a partly cloudy day, grab a blanket and let your gaze travel up to the sky. Watch for familiar shapes in the clouds, and make a list of your favorites. Make a Scavenger Hunt. Make a list of items you are likely to find outdoors in a nearby park or open space, and work as a team to get familiar with the natural spaces around you by searching for what you already know – rocks, leaves, twigs, certain colors of plants, etc. Or, alternatively, you could go searching for items that represent thoughts/feelings your child (or you!) is struggling with that week, and use the items as a way to talk about the problems. Remember to leave everything as you found it. 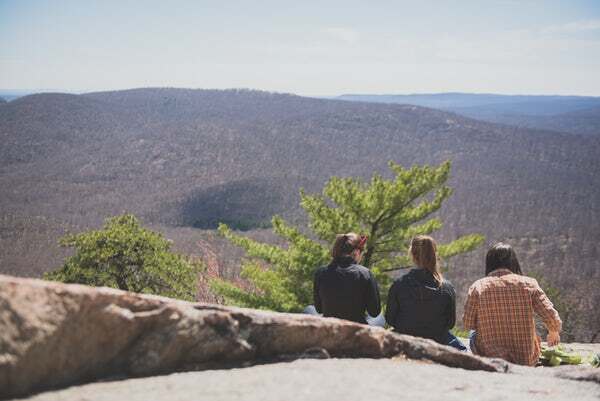 This summer, we’ve also decided that in order to help teens slow down and feel the benefits of spending time outside, we’re conducting our summer teen girls group all outdoors. As we tackle tough issues like peer relationships, confidence, hard-to-manage emotions, and anxiety, we’ll also practice mindful nature activities.